Often, the best way to learn about problems is to observe them first hand. This helps you gain a deeper understanding of the barriers, gaps and challenges facing crisis-affected populations and those who serve them. By immersing yourself in the environments in which interventions are designed, carried out and experienced, you’ll be able to generate all sorts of insights around the routines, perspectives, habits, practices, relationships and patterns of behaviour of a range of stakeholder groups involved – directly or indirectly – in the development and implementation of a programme or service. These kinds of activities can help reveal what works well, what doesn’t, and why, when it comes to existing humanitarian interventions from the perspective of the end-user as well as that of the service provider. Peer-to-peer observation: Looking at how other users might be tackling this problem. Non-participant observation: Observe what happens in a process or situation. Shadowing: Follow the ‘problem holder’ around while they are dealing with the problem. First-hand experience: Take on the role of the problem holder and do what they do. Arrange your observational activities in advance. If you are getting a guided tour of a place where humanitarian products and services are provided, think about how your tour might be organised. Make sure that you think through how you intend to record your learning. We recommend undertaking visits with two people, one to ask questions and one to take notes. Try to find out in advance whether you’ll be able to take photos and record audio, but always make sure that you have the permission of those you record on the day. Activities: What kind of activities are people engaged in? What steps do the processes involve? Why are they doing this? Environment: What are the characteristics of the environment? How does the environment affect how people behave? Interactions: Who is interacting with users? What is the purpose of these interactions? How are they carried out? What is helping or hindering these interactions? Objects: What objects (or products) are being used? Are they central or peripheral to activities? How are they harnessed to conduct activities? Are they fulfilling their ‘job’? Users: Who are the users? What are their needs and drivers of behaviour? 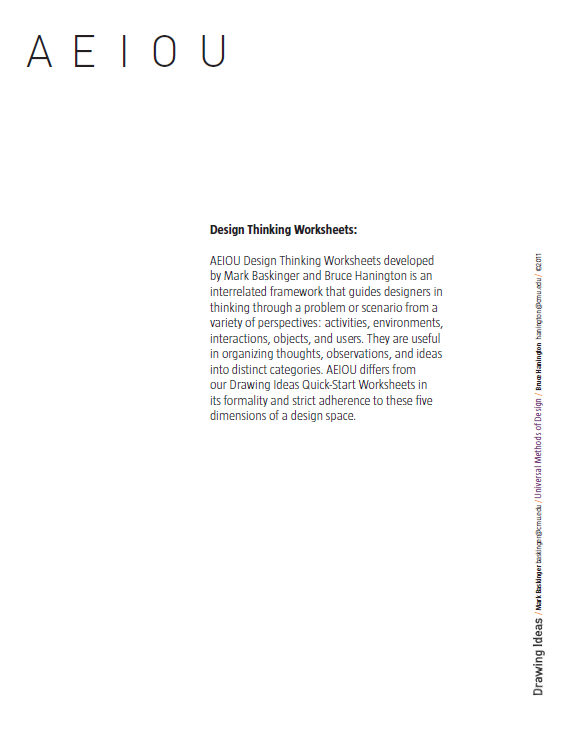 The AEIOU Design Thinking Worksheets, developed by Mark Baskinger and Bruce Hanington at Carnegie Mellon University, are a great resource to help you organise your thoughts, observations and ideas into distinct categories. IDEO’s Design Kit is also a good source of advice and Nesta’s DIY Toolkit provides another useful template for gathering information. Lastly, Unicef’s Demand for Health Services toolkit provides guidance and tools for exploring the users’ environment that is broadly applicable outside of the health sector. If you are carrying out observational activities in a humanitarian context, ensure that the area where you carry out your observations is safe, and that your activities are culturally appropriate and do not put any of your staff or partner staff at risk. If community members are the focus of your observational activities, ensure that you respect their dignity, that you do not expose them to protection risks or falsely raise expectations, and that you follow up with findings and feedback where appropriate. Lastly, ensure that you adhere to humanitarian principles and standards by gaining informed consent from all individuals under observation, and putting in place robust data protection guidelines for managing personal, identifiable data. If you’re recording video or audio, state exactly how you will use the recording and ask people to confirm their consent on camera for your records. If you’re taking photographs, produce a consent form, detailing how you will use the images, and ask people to sign their name at the end.